Here's what else you do Sunday, August 26, 2012. 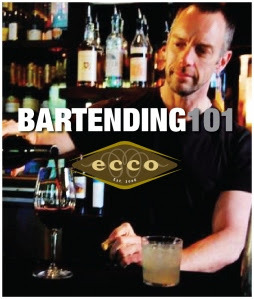 Try out bartending class with Eric at Ecco on Sunday at 4:30. Here's an alternate to our Latino Festival Day plan for Sunday. Try out bartending class with Eric Aarons at Ecco. Eric the great will be teaching the crowd how to turn ingredients into magic on Sunday afternoon. You can't miss that! Check out this post on Fifth Group's blog for more deets. See you there!